Althea Gibson fought through the racism of mid-century America to become one of women’s tennis greats. The mid-to-late 1950s was a dangerous time for black American people. Emmett Till was murdered in 1955. Rosa Parks refused to give up her seat and the subsequent Montgomery Bus Boycott took place that year until 1956. Racism was rife and nothing was being done to resolve it. The KKK and their supporters became rampant in their aim to exterminate blackness from their country. In the midst of this, a black athlete from Silver, South Carolina, strove to reach the pinnacle of a sport dominated by white athletes. 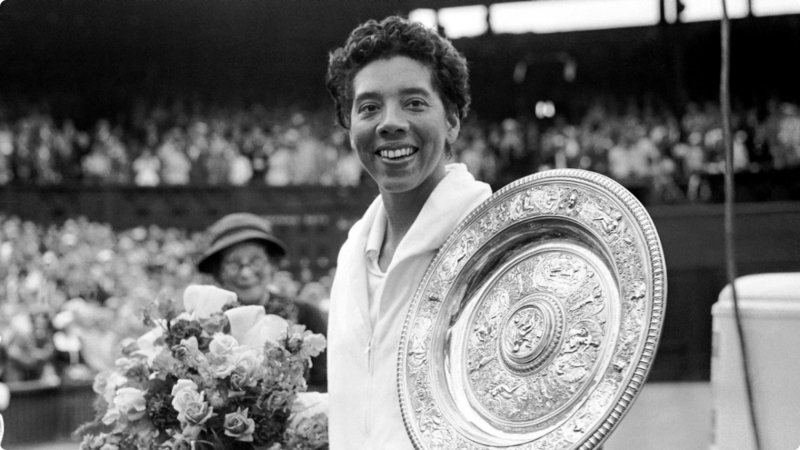 Her name was Althea Gibson. Althea was born to Daniel and Annie Bell Gibson, who worked as sharecroppers on a cotton farm. They moved to Harlem in 1930. Where they moved was a designated sporting area and by the time she was 12, Althea had already become the New York City women’s paddle tennis champion. Two years later, she entered the ATA New York State Championship and won. She then went on to win the ATA national championship in the girls’ division in 1944 and 1945, and then a run of ten consecutive national ATA women’s titles from 1947 to 1956. This success and evident prowess caught the attention of Walter Johnson. He was active within the African-American tennis community and helped her gain the funding to enter bigger tournaments and the USTA (United States Tennis Association). Unfortunately, due to her race, she was barred from entering the United States National Championships (he precursor to the US Open). This was due to tournaments needed to qualify for the championships being held in white-only clubs, despite the USTA having strict rules against racial and ethnic discrimination. This was later changed after staunch backlash from the ATA and World No. 1 at the time, Alice Marble. By 1951, Althea won her first international title – the Caribbean Championships in Jamaica. She would go on to enter Wimbledon that year as their first black player, losing in the third round to Beverly Baker (who would reach the final in 1955). She considered joining the Army but decided against it after joining a goodwill tour across Asia. The tour did the spectators – and herself – the world of good. She went on to 16 tournaments across Asia and Europe during her stint. 1956 was to be a landmark year for Althea. She became the first black athlete to win a grand slam with the French Open singles title. With British player, Angela Buxton, she also won the doubles title. She also added the Wimbledon doubles title (with Buxton again), the Italian national championship, and the Asian Championship. The next year she won Wimbledon as its first black champion and the first champion to be personally handed her trophy by Queen Elizabeth II. The doubles title stayed in Gibson’s hands for a second straight year. By the end of the season, she had reached eight Grand Slam finals, won 5 in singles and doubles, and achieved the world #1 ranking. In 1958, Gibson defended her Wimbledon titles in singles and doubles, the U.S. National singles title, and reached World #1 again. She retired that year but stayed close to the sport as she pursued a new career – golfing. In 1964, she became the first African-American woman to join the LPGA tour. She was one of the tour’s top 50 earners for five years, in the backdrop of further racial segregation. Clubhouses had a race ban and she would often have to change in her car because of it. She retired in 1978 with a highest rank of #27. Post-retirement, Althea helped the underprivileged get into sports through numerous programs and commissions. She suffered two cerebral hemorrhages in the 80s and a stroke in 1992. In 2003, Althea Gibson survived a heart attack, and sadly passed away on September 28th at the age of 76. Her legacy lives on through both women of colour in tennis but sport overall. In a 1977 New York Times columnist William C. Rhoden said, “Althea Gibson [and Wilma Rudolph] are, without question, the most significant athletic forces among black women in sports history.” Gibson was inducted into the International Women’s Sports Hall of Fame and received the Theodore Roosevelt Award in 1991. Her tennis record is astounding when looked at from a social perspective. With so much happening amongst her peers, she strove to be the best she could and perform alongside white athletes who didn’t have the same tribulations she did. She was not welcome in places other athletes were, not on talent, but merely not the tone of her skin. Amongst all of this, she won 11 grand slam titles in her career and reached at least the finals in every single one. From 1956 to 1958, she reached at least the quarter final of every singles championship she entered.